Once stopped, login through FTP and find the serverconfig.xml file. After opening the file, a list of settings will show. Please see the below sections for information on each and what you can set the values to. Sticking to the file structure, make your changes and then save the file. The following information below is the configuration changes and settings for Alpha 17.2 for 7 Days to Die, which introduces an XP multiplier along with changes to the frequency / timing of the Blood Moons. property = This "begins" the line. It tells the server we are modifying a specific setting. name = This is the property that we are editing. Leave this alone. <!-- = This indicates the beginning of a comment that is ignored by the server. Think of this as a note written on the margin. --> = This indicates the end of a comment. Anything after this will be processed by the server. The settings listed below will list the property name, two example values, and a brief description. You can also find a brief description as well as listed values within the serverconfig.xml file itself. Some values are handled specifically by our system and will be indicated with an DO NOT CHANGE as the "example". Some sections of the file are omitted for the same reason as well. ServerName -- "This is my server name!" This is the name of the server people will see in their Steam server favorites list or the in game server browser. ServerDescription -- "Free for all, no admins, Blood Moon every 4 days. Game on!" In the in game server browser, clicking on your server will display this on the right pane. 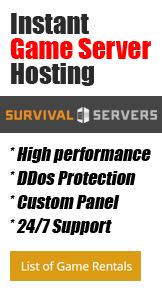 Website URL for the server, will be shown in the serverbrowser as a clickable link. Password to gain entry to the server. ServerLoginConfirmationText -- "Are you ready for this?! Everyone's trigger happy, be careful!" Port you want the server to listen on. Visibility of this server: 2 = public, 1 = only shown to friends, 0 = not listed. As you are never friend of a dedicated server setting this to "1" will only work when the first player connects manually by IP. EACEnabled -- "true" or "false"
Enables/Disables EasyAntiCheat. Some mods require this to be set to "false". If players are EAC banned but want to play, set this to "false". Hide logging of command execution. 0 = show everything, 1 = hide only from Telnet/ControlPanel, 2 = also hide from remote game clients, 3 = hide everything. Override how many chunks can be uncovered on the ingame map by each player. Resulting max map file size limit per player is (x * 512 Bytes), uncovered area is (x * 256 m²). Default 131072 means max 32 km² can be uncovered at any time. If disabled a player can join with any selected profile. If true they will join with the last profile they joined with. GameWorld -- "RWG" or "Navezgane"
RWG (see WorldGenSeed and WorldGenSize options below) or any already existing world name in the Worlds folder. Navezgane is the "story" map for 7 Days to Die. If RWG this controls the width and height of the created world. It is also used in combination with WorldGenSeed to create the internal RWG seed thus also creating a unique map name even if using the same WorldGenSeed. Has to be between 2048 and 16384. Larger map sizes = longer start times, possible lag, and longer time to download and join. BuildCreate -- "true" or "false"
cheat mode on/off. This is similar to creative mode with Minecraft. real time minutes per in game day. For the default value, one real time hour = one in game day. Highest number tested for this has been 120 minutes. 0 = everything, 1 = toolbelt only, 2 = backpack only, 3 = delete all. Size of bedroll deadzone, no zombies will spawn inside this area, and any cleared sleeper volumes that touch a bedroll deadzone will not spawn after they've been cleared. Making this number too large (more than about 80) may cause servers to run at poor framerates which will effect lag and play quality for clients. If your server has a large number of players you can increase this limit to add more wildlife. Animals don't consume as much CPU as zombies. NOTE: That this doesn't cause more animals to spawn arbitrarily: The biome spawning system only spawns a certain number of animals in a given area, but if you have lots of players that are all spread out then you may be hitting the limit and can increase it. EnemySpawnMode -- "true" or "false"
0-4 (walk, jog, run, sprint, nightmare) This is the speed at which zombies classified as feral (glowing eyes) will move. 0-4 (walk, jog, run, sprint, nightmare). This is the speed at which all zombies will move at Blood Moon who are non-feral. What frequency (in days) should a blood moon take place. Normally the blood moon occurs every 7th day. Number of days of "deviation" that can be applied to the next blood moon. A value of "1" can mean the next blood moon occurs on the 6th, 7th, or 8th day. The number of zombies spawned during blood moons per player. Turn this value down if your server is experiencing some performance issues. The Hour number that the red day number begins on a blood moon day. Setting this to -1 makes the red never show. Percentage in whole numbers. The higher the number, the more ammo, feathers, etc. you'll find. Days in whole numbers. 7 is a good number to help restock for blood moons. AirDropMarker -- "true" or "false". Sets if a marker is added to map/compass for air drops. The distance you must be within to receive party shared kill XP and quest party kill objective credit. A good number to use is 200m, as this will help crafters in the base receive experience. Maximum allowed land claims per player. Controls how offline players land claims decay. All claims have full protection for the first 24hrs. 0=Linear, 1=Exponential, 2=Full protection until claim is expired. This page was last modified on 10 March 2019, at 09:16.